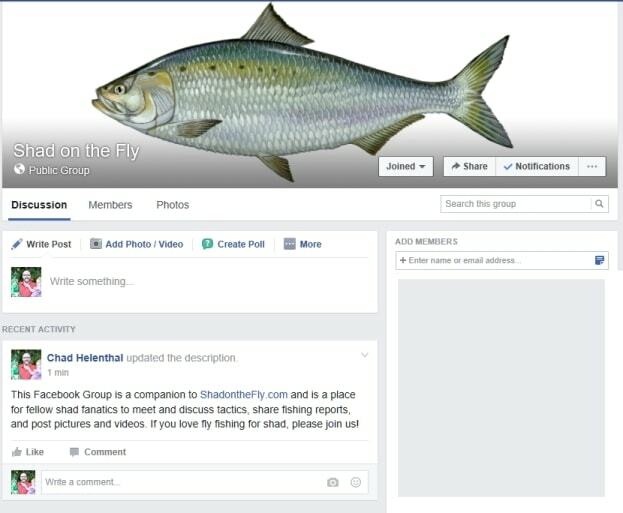 I am excited to announce the creation of the new Shad on the Fly Facebook Group! Several people reached out during the 2015/2016 Shad run and recommended adding a discussion forum to this site where we could trade fishing reports, discuss tactics, share fly patterns, and post pictures and videos. After giving it some thought and doing some research, I decided to take advantage of the group functionality within Facebook rather than attempting to setup and then moderate a separate forum. The Shad on the Fly Facebook Group will receive updates when new posts are added here, so if you are not subscribed to Shad on the Fly via an RSS reader and would like to receive notifications for updates, you can do so by joining the group. If you enjoy fly fishing for shad as much as I do, please become a member of the Shad on the Fly Facebook Group and join other shad fanatics in discussion, trade stories and advice as well as pictures and videos during future shad runs!